For any Rolex watch lover, the best holiday gift is another Rolex, especially ones from Beckertime. But for the person who has plenty of watches and another Rolex would be lost in the collection, there are smaller watch related stocking stuffers that any watch lover would appreciate. For your watch aficionado who frequently changes straps, consider giving you watch pal a NATO Strap. To some Rolex wearers, an Oyster bracelet feel heavy and under heavy perspiration the Oyster bracelet leaves black marks. Adding a silicon or TPE strap lightens the watch, and there is no black gunk when wearing during sports events. NATO straps are made of nylon cloth and are designed such that the strap is continuous and not two-pieces like traditional watch straps. NATO straps are found on multiple places on the Internet, inexpensive, and are easy to change. Some people have a different NATO strap to match the suit they are wearing for the day. 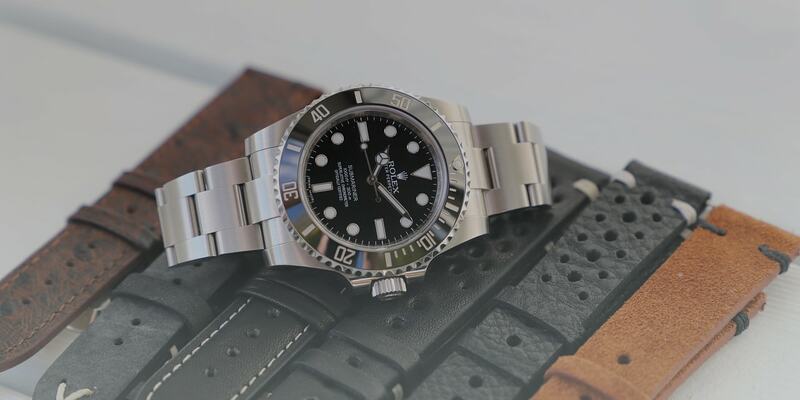 For Rolex sport watches, another option is to replace the Oyster bracelet with a specially designed silicon rubber strap replacement by RubberB or Everest Straps. Both the RubberB and the Everest Strap are designed specifically for Rolex out of high quality vulcanized silicon rubber, or in Everest’s case, Thermoplastic rubber. Unlike other replacement rubber straps found on eBay, these straps are hand crafted and designed to fit Rolex sport watches exclusively. The advantages of a silicon or TPE rubber straps are that they are light, they do not capture dirt, grime, and sweat like the Oyster straps, and they have a little give/stretch in them that makes them very comfortable to wear. Veraet Watch Spray is liquid cleaner specifically designed for watches. Veraet does not require water and comes in a simple spray bottle that travels well. Unlike other chemical cleaners, Veraet Watch Spray does not deteriorate rubber watch seals yet it cleans grime, grit, and film that covers every watch over time. Veraet Watch Spray cleans inside the fine satin grain on Oyster Bracelets and lugs on a Rolex watch case that makes the watch look like it just came out of dealer’s watch case. Even though Rolex does include a cotton/suede like cleaning cloth in all their watch boxes, there are other options as well. Your watch lover might use use anything from an old t-shirt or bathroom towel to fine silk for wiping down their watches, but most of the watch cognoscenti use either a microfiber cloth or suede for cleaning their watches. Both Veraet as well as Googalie make cleaning cloths that work very well for removing smudges, gick, and normal grime that dulls a watch finish. A good microfiber or suede cleaning cloth matched with Veraet Watch Spray will make any watch look like it was just out of the display box. As found elsewhere on the blog, the safest place for a Rolex is on one’s wrist, but perhaps the next safest place while traveling is a Rolex pouch. Rolex distributes service pouches, much like the one shown here for carrying their watches. These pouches were initially developed for Rolex service –when a customer would pick up their newly serviced watch from Rolex, they would receive their watch in this carry pouch. Unlike a sock or eyeglass pouch that your watch aficionado might use otherwise, this case clearly says that there is a watch inside. 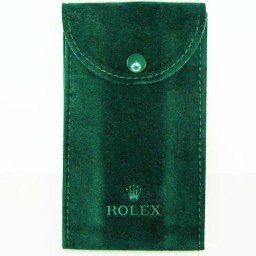 The Rolex pouch contains an insert to slip between the bracelet clasp and the caseback to prevent scratches, and there is soft velvet suede that protects the crystal. Although it is not a hard case, it is a great pouch to carry your watch in a pocket or briefcase, and fits in a holiday stocking quite well.